Audi A1 hybrid prototype review | What Car? The Audi A1 dual-mode hybrid is a prototype vehicle designed to test a new powertrain that could be used in future Audis. At its heart is an all-new system that combines a petrol engine and two electric motors. All three are connected via a single-speed transmission and sit between the (driven) front wheels in the space that would normally be occupied by a conventional engine. A battery pack - mounted at the rear of the car - can be recharged from a fast-charging point in around two hours. The petrol engine is an all-new 127bhp 1.5-litre three-cylinder unit derived from Audi's 2.0-litre four-cylinder engine. A 67bhp electric motor functions as a starter and alternator, while the second (114bhp) electric motor is used to drive the wheels. From standstill to 34mph, the larger electric motor alone powers the car. In this mode, the petrol engine and smaller electric motor produce electrical energy like a range-extender to keep the battery charged. Above 34mph, the system's control unit combines the two power sources for maximum efficiency and performance. Above 81mph, power is usually supplied by the petrol engine, but the electric motor can boost this if necessary. What's the Audi A1 dual-mode hybrid like to drive? Our test drive was brief, but it was enough to suggest that this powertrain has real potential. At low speed, the electric motor provides strong acceleration, and it's very quiet. When you accelerate up to higher speed the shift to the petrol engine is just about unnoticeable. It, too, is remarkably quiet, and the single-speed transmission is smooth throughout. Audi's engineers wouldn't tell us how much the system weighs, but it does feel as if there's extra bulk over the A1's front wheels. It doesn't stop it being good to drive, but there's enough to make it feel less nimble and not as forgiving over bumps. What's the Audi A1 dual-mode hybrid like inside? Apart from a display that tells you how the which part of the powertrain is doing what, the prototype's interior is just like any other Audi A1's. Audi hasn't released full technical details, but it says the 'majority' of the battery system is mounted underneath the rear seat, so there's little impact on cabin or boot space. Audi has produced a number of A1 dual-mode hybrid prototypes and the system's sophistication and compact packaging suggest that it would work well in future production models. For now, however, it remains one of many possible options. 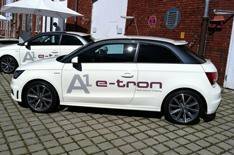 Audi is currently testing A1 e-tron models that use an entirely different system, with a rotary motor acting as a range-extender for an all-electric powertrain. Audi is planning to launch a range of models with various power sources over the next 18 months. The all-electric R8 e-tron goes on sale in 2013, and a plug-in hybrid version of the new Audi A3 is due in 2014.